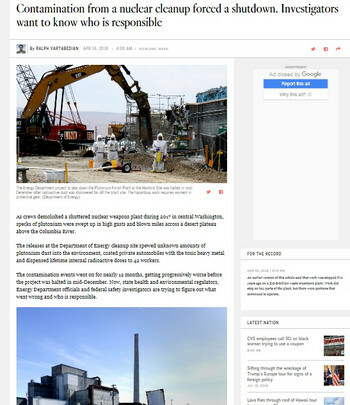 ・　Tom Carpenter, executive director of the watchdog group Hanford Challenge, asserts that the demolition project used too many unskilled workers, attempted to do the work too fast and failed to adopt known safety measures that would have helped contain the contamination. ・　"It is very upsetting because they don't [care]," said one exposed worker who would speak only on condition of anonymity out of fear of retaliation. He said he was not given a kit to test for plutonium exposure until he asked for one in early December. ・　One of those facilities, known as 324 Building, was used to extract plutonium from spent fuel, said Robert Alvarez, a former assistant secretary of Energy and a longtime critic of the cleanup. The facility has civilian waste from Germany, sent as part of a research project, as well as large amounts of radioactive waste that was placed in unlined burial pits, he said. Records of what lies in the pits were destroyed in 1988, he said.